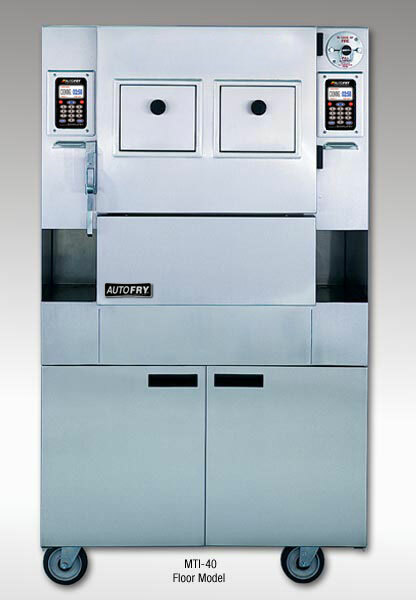 AUTOFRY� Model MTI-40E The Autofry MTI-40E is a dual-basket floor model designed to meet the requirements of high-volume food service operators. Fully enclosed and automated, the Autofry keeps employees safe from the internal cooking chamber while preparing food product to perfection each and every time. The MTI-40E provides the flexibility to operate each side independently and is available with a manual or automated oil filtration system. Now you can expand your menu with deep fried favorites without the expense of hoods and vents. MTI's proprietary Simplifry� technology offers multiple programmable pre-sets, standby mode and heat/time compensation intelligence.